A fresh new addition to this year's education programme is the President's Choice session, which we plan to make a regular feature in many future congresses to come! We are truly honoured to have with us this year, Dr. Khetsiwe Dlamini, Chief of Staff at the Office of the Executive Director, UN Women. Click here to read more! ICCA Best Marketing Award - Patrick's praise for ICCA members! Patrick Delaney of ICCA member company, SoolNua, and Chairman of the ICCA BMA, believes that (in his own words!) 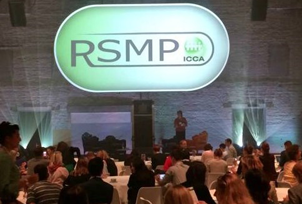 "ICCA members create and execute awesome marketing programmes!" Outside the Box sessions - An authentic Argentinian taste! Returning to the congress programme this year, are two opportunities for delegates to experience the congress off-site! We're looking for great case studies, innovative new initiatives, and strong opinions! 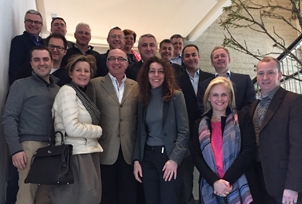 We're grateful to our friend Keith Foley for sharing his impressions from attending the two-day IPCAA conference held in March, involving medical associations, pharmaceutical company representatives, key European regulatory bodies, and many ICCA PCOs. All ICCA members are facing ever-increasing time pressures, so we’ve tightened up the programme structure at both start and finish, whilst keeping the most important business, educational, and networking elements intact. 4 ICCA Congress Speakers make MeetingsNet's Best of 2014 list. 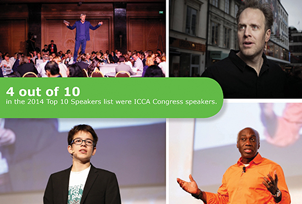 Thank you, MeetingsNet, for recognising four ICCA Congress speakers in their 2014 Top 10 speakers list. We are very proud to have had Eric de Groot, Felix Finkbeiner, Eddie Obeng, and Magnus Lindkvist share their knowledge and vision at the 53rd ICCA Congress in Antalya, Turkey last year. Read the full list here. Christian Mutschlechner, Director, Vienna Convention Bureau, lists both the ICCA Congress and the ICCA RSMP as essential training in his Guide to CVB Staff Training and Development.